Skreddy Pedals™ Zero: Cutting and articulate, yet thick and smooth; this high-gain fuzz retains amazing note clarity with chords, tears it up on riffs, and soars with sweet harmonic sustain on solos. Classic, over-the-top distortion with no woofiness. Doesn't get lost in the mix, yet has plenty of bottom and a velvety-smooth high end. Sounds like a cranked up, distorted, high-gain amp, with an obscene amount of volume available. Versatile; it merges with your own personal style of playing. Create your own unique soundscapes inspired by this vintage-style, 4-silicon-transistor distortion/fuzz/sustain stompbox. The Zero's™ exciting tone is optimized using the finest available new components and some sweet-sounding new-old-stock parts. Modern features include DC adapter jack, LED on/off indicator, and true bypass switching. Hugest fuzz of its size! Riff to Compare - Riff for Fun! Turn it Back Up for the Anthem! My Sound Clips recorded with my Strat into Zero prototype into clean Traynor Mark III amp into Jackson 2x12 speaker cab into SM57 mic directly into crappy PC soundcard. Neck Pickup --Light reverb/subtle doubling delay added via CoolEdit. "The Zero is awesome, the harmonics really really jump out of the guitar with it and the tone knob is awesome you can get all sorts of USEABLE sounds out of it, unlike other fuzzes that i've tried where the tone knob is only useable between certain points, but the zero sounds awesome all around. I'll be giving it a full run through on sunday at band practice but in either case it delivers in spades." "you will NOT be disappointed with the Zero, i just got #8 in the post late last week and havent been able to turn it off since i got it on my pedalboard, great fat sound, thick bottom end, and a nice top-end that doesn't get too peircing, i think it just cured my Wooly Mammoth GAS......"
"ive tried alot of high-gain pedals that have a very narrow range of usable sound, or one-trick-ponies, that sound great either cranked at a rehersal, or in my music room, but not both, i think that the ZERO is the 1st one ive been impressed with all across the spectrum...very versatile, and since im not a 15min guitar solo kinda player, i need something that stays defined with chords, which is very hard to get with fuzz... great work, i have nothing but good things to say about it." "hey marc, just wanted to let you know that i got the pedal in today. the zero sounds fantastic! its alot better than i expected. i actually like it better than channel 2 on my mesa rectifier, and thats normally what i play through." "I picked up my Zero from the Post Office this morning, and I love it! It's exactly what I've been looking for. Really smooth and HUGE sounding. Cuts through like a knife and the tone control is actually useable. I can't wait to play it live and get it on a few of my band's songs. "At higher gain settings It's easily the most harmonically rich fuzz I've ever heard. Unbelievable! ... This thing will take on all comers. Very nice Skred. Very nice." 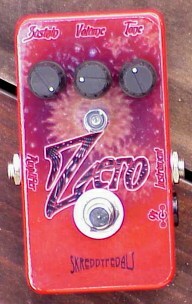 ... the Zero is just the greatest pedal I have ever had. I use all the time.